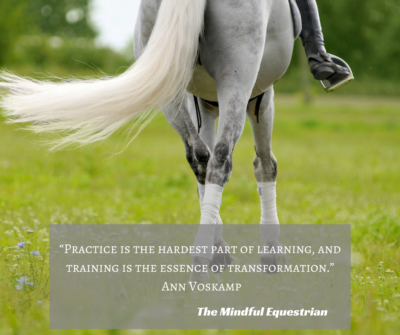 One exercise I use with my students is around relaxing and feeling the horse while riding. I will have them do shortening, lengthening and transitions. The riders are encouraged to concentrate on sitting deep and communicating with their seats first before going to their hands. As they do this they also focus on staying elastic throughout the ride. 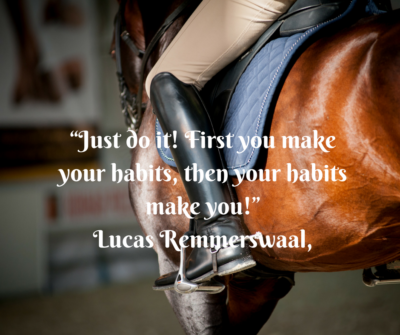 In order to do this riders have to fight their muscle memory so they can change their old habits. Riders will often say to me something like, I feel it, but I can’t make my body do it. That is probably the toughest thing about riding and definitely the toughest thing about life. We finally get this awareness about something we need to change. We know it is right and it is what we need to do, but we keep slipping back into old habits. That is okay. It takes time to change something we have done as a regular habit. It took time to create the bad habit, so it will definitely take time to change it. We often get angry with ourselves for slipping back into old patterns Caught up in worrying about this, we can lose sight of our new sense of awareness and that we have found the new good habit. There is no self-reward for that great accomplishment. Instead we beat ourselves up for not being able to fully sustain this new habit and way of riding. If we let go of this anger and frustration, and instead focus on positive growth, we will eventually, with much practice, slip less and less back into those old ways while developing new, good habits. It takes dedication and perseverance to do so. It is not a quick fix. This is true in riding and any part of our lives. 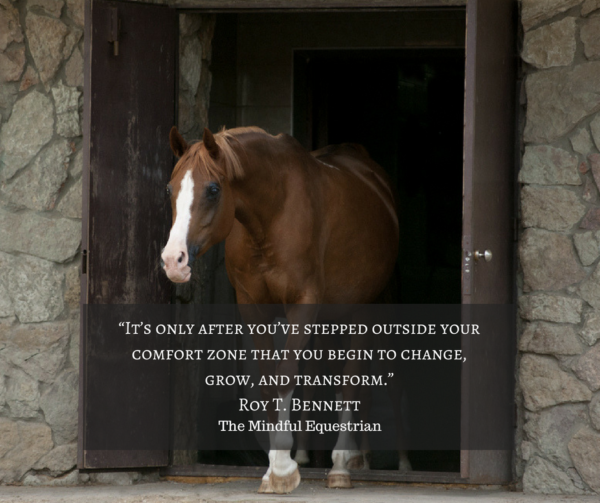 Becoming mindful and aware are the first and most important steps that need to happen before a change can occur. Then it is a matter of practice. One thing we always have to remember though is to forgive ourselves for making mistakes so that we don’t stay stuck in them. We are human after all.